Street MMA: Female fight ends, turns into a massive dance party? A Lesson in Street MMA: Female fight ends in a soccer kick, immediately turns into a massive dance party? There is hope for the future. Even in our darkest hour, the power of Street MMA and I guess dance can bring us together. Also, everybody has to dance when they hear E-40 come on, right? That was E-40? Seriously though, what is going on here? People were fighting in the parking lot, now there’s dancing in unison like it was an ABC Family made-for-TV movie? We’d like to say we’re surprised but we shouldn’t be. Just when we thought we learned all of our lessons in Street MMA, a dance party breaks out post-fight. Not even a few seconds after the fight was over and a winner was declared. Like these people don’t even skip a beat. Girl gets her head rocked and we are going right into dance mode like that fight didn’t just happen. Amazing. 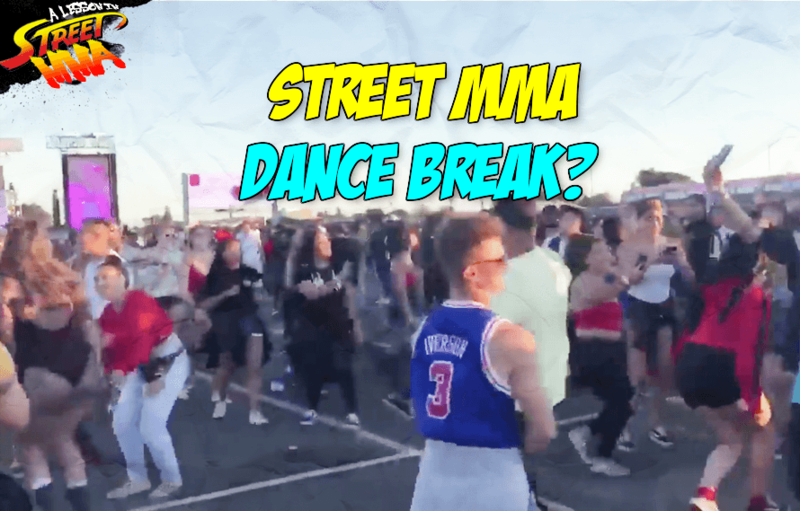 Come for the Street Fights, stay for what appears to be a choreographed and rehearsed dance routine. What is this life? The world may be coming to the end according to your local news and everywhere you turn on the big bad Internet but these people don’t give a damn. Fights and a freestyle dance off? Now that’s our kind of party. As far as the Street MMA, the fight wasn’t anything to text home about. We did see some nice clinch work, a throw and an unchecked soccer kick to the face. Hair pulling and our wig snatching also surely did occur. Still 99% sure our two competitors actually started dancing with one another after the fight. No beef is too strong to withstand the up beat melodies of some Bay Area hip-hop. Bless you E-40 and or Too Short.